Is your life prosperous? And no, it does not refer solely to how much money your have. Prosperity is certainly related to money, however I do not believe that money alone represents prosperity. I have been doing intuitive readings for many years, and some of my regular clients are some of the wealthiest people in the country. Yet, many of them suffer broken relationships, heartache, and face other life struggles. Even though their money is in order, they are lacking in many other areas of their lives. So, it is my conviction that the true definition for prosperity is not just money, but rather a feeling of fulfillment in all areas of life. If you need a boost in this area of your life, there are five stones that have energetic properties that can bring about greater prosperity. The power of these crystals are due to their resonant energy. Resonant energy is the vibrational quality of the things around us. Everything carries an energy signature, and the reason why crystals are quite popular in metaphysical practices is because the energy these crystals resonate is often at a higher frequency compared to other tools and esoteric objects. This is due to their unique matrixes and the minerals within each crystal. Below is a list of my top five prosperity crystals. These are by no means the only crystals that can help to attract prosperity, and it is important to understand that other practitioners could possibly develop a different list than I have comprised here. 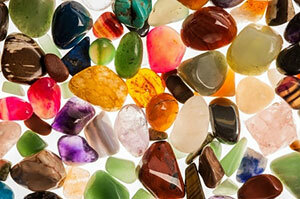 However, in my personal life and practice these are the crystals that I use to bring about prosperity. Tiger’s eye is an orange-gold crystal with shimmering bands along the matrix of the stone. You can often find this crystal as a polished gem, set in jewelry, or carved into an image. Tiger’s eye is a stone for motivation. It can be used for overcoming addictions, clearing out negative emotional patterns, and creating momentum related to a life goal or plan. Some associate this crystal with money, due to the unique golden fibers that appear in the matrix of the crystal. Even though this stone get’s you moving, its energy can also be very grounding, which is part of the reason why the energy of the crystal can create such momentum. We must first understand where we are before we can take any real steps forward. If you want to use this particular crystal in your personal practice, I recommend that you use it when you are meditating, due to its ability to ground an individual. This is also a wonderful stone to wear for its unique beauty and energy. Even though most people are more familiar with the green variety of Jade, this particular stone actually comes in a multitude of colors. For the purpose of prosperity I would recommend green or orange jade, since both colors are often associated with manifesting prosperity. Jade is a stone that is known to bring peace in any situation. If you are experiencing a tumultuous time in your life, you may want to pick up a piece of jade and carry it with you wherever you go. Jade is also a stone known for bringing about luck and prosperity to the holder. In my personal practice I tend to wear a lot of jade. Not often, but when it feels right, especially if I am going through a uniquely difficult time. It is very easy to find jade jewelry just about anywhere in the world. Citrine is a yellow or orange colored stone. Its energetic properties are associated with manifesting and willpower. Since it is a yellowish stone it is a great solar plexus chakra stone, increasing willpower, personal power and confidence in your own abilities. Citrine is also a great stone for creativity. I personally do not wear citrine, but I do have a very large piece of citrine next to my drafting table for when I am doing creative projects. You may also want to put a piece of citrine on an alter or in your sacred space to assist you in manifesting your highest good. Ruby is a beautiful red stone that symbolizes prosperity in many cultures. This particular crystal is associated with the root chakra and can bring both grounding and earth energy into a situation. For prosperity purposes I would recommend wearing this particular crystal if you are having trouble holding on to your money. If you feel like more money is going out than coming in, and you are trying to take control of your spending habits, ruby is a great crystal to aid you in bringing things back to the center. Moss agate is a milky white and green stone that represents the harvest. This is an excellent crystal to have along with you when you are engaging in a new business venture or investment opportunity. This crystal literally represents bringing in the harvest, and has been used for centuries for agricultural purposes. This is also a great stone for clearing your mind and your environment, and is often used in Feng Shui practices. When it comes to using crystals I always recommend that individuals find crystals that resonate with them. Not every crystal is going to respond the same way to the every individual, which is why it is important to follow your instinct when developing a collection of crystals. Pick them up, and see if they feel right in your hand. If it is a piece of jewelry, try it on before you buy it, or if you are purchasing it online visualize yourself wearing the piece. This will increase both the effectiveness of the metaphysical properties, as well as the overall enjoyment of using crystals as a part of your evolutionary growth.